Make the dressing: Place all ingredients in a blender and blend until smooth. Set aside. Preheat oven to 350˚. In a skillet over medium-high heat, heat oil. Season each chicken breast with salt and pepper and place in the skillet. Sear chicken, 3 to 4 minutes per side. Transfer skillet to oven and continue to cook, 8 minutes. Remove from heat and transfer chicken to a cutting board. Cool 7 to 10 minutes before slicing. To assemble: Pour half the dressing into a large mixing bowl and toss together with shredded romaine. 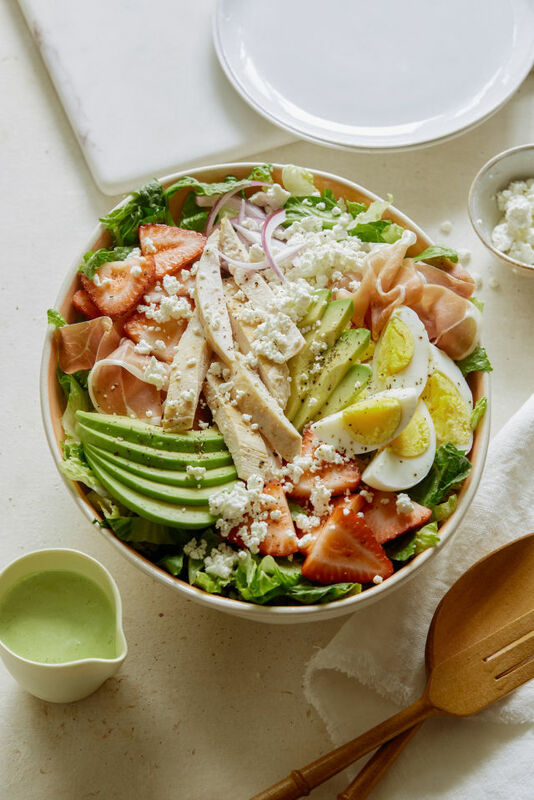 Transfer coated romaine to a serving bowl and top with sliced chicken breasts, strawberries, avocado, onion, goat cheese, prosciutto, and egg. Season entire salad with salt and pepper. Serve entire salad, family style, alongside remaining dressing.